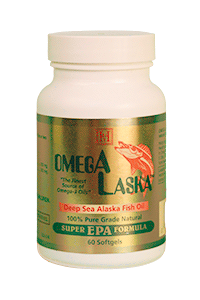 OMEGA LASKA® is a natural fish oil concentrate from Alaskan cold water fish that provides a rich dietary source of Omega-3 fatty acids, EPA and DHA, in an easy to swallow softgel. These polyunsaturated fats are not produced by the body and must be obtained through supplementation. Omega-3s stabilize the heartbeat, and can improve blood flow by reducing triglyceride levels. They also may slow the growth of plaques by making platelets less “sticky”. Omega-3 fatty acids boost HDL (the good cholesterol) levels and help keep arteries clear. Keeping arteries clear helps to improve brain function. Omega-3s can also alter your neurotransmitters, which can help reduce depression. OMEGA LASKA® also provides lubrication to the joints to help them function effectively, reducing grinding and overall wear and tear on the joints which helps to prevent and decrease inflammation and joint pain.